Download Nudger Version 2.0 Updated Dec 9, 2013 - Recompiled using Visual Studio 2010 and ASCOM Platform Developer Components (6SP3); Use this version for ASCOM Platform 6. 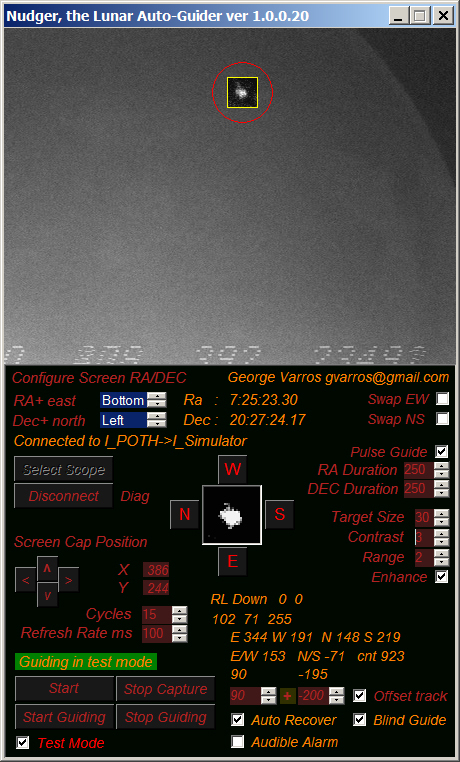 I wrote an application that can be used to auto-guide an ASCOM driven telescope, by tracking brighter objects on the earth-shine illuminated shadowed surface of the moon. It removes the need to constantly make pointing adjustments using the hand controller. It is call it "Nudger, The Lunar Auto-Guider" because it nudges the telescope ever so slightly when needed to maintain accurate pointing. It is intended to be used by individuals or groups that monitor the moon for meteoroid impacts. 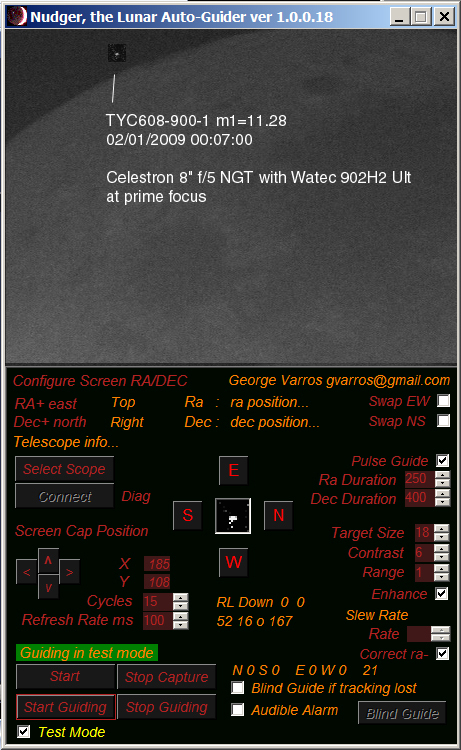 Lunar guiding rates in telescope mounts can be inaccurate. While imaging the moon for meteoroid impacts using low light level cameras, features on the lunar surface illuminated by earth-shine, can be seen above the background darkness. This subtle illumination of lunar features allows them to be tracked and used to guide the telescope's pointing. Although less desirable, bright terminator features can also be tracked. The "negative" feature allows the sun to be tracked from sunspots. My sincerest thanks to Stefano Sposetti and Gene Mroz who have been extremely helpful by testing Nudger and providing feedback. Note on Video Overlay: Some systems use video overlay to preview live video footage which will prevent Nudger from capturing the video window. There is a section in the Nudger Instructions on how to disable Video Overlay in XP and Windows 7. Screen capture of Nudger tracking Aristarchus from an AVI file. Magnitude 11.28 TYC608-900-1 being tracked from an avi file to see how deep Nudger will go. Looks like it will go deeper. Celestron 8" f/5 with Watec 902H2 Ult at prime focus.